Marmalades are nothing but fruit jellies or jams with the peels of those fruits added to them in the form of annular rings, shreds or slices. 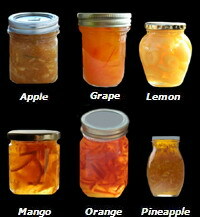 Thus, we can prepare lemon, orange, mango, pineapple etc marmalades. The peels, slices etc are also to be added when the jams are jellies are boiling with sugar in the processing stages. Squashes are a concentrated form of fruit beverages. They are normally consumed after reconstitution with water to the extent of 3 to 4 times. But the taste will not be sweeter as such you may have to add some sugar before serving. They are preferred because of their ready to serve nature. Among the squashes Orange, mango, pineapple, lemon and grapes are the most commonly consumed in the order of preference. Let us see how commercially the squash is manufactured. In the case of the famous “Noga” (Nagpur Orange Growers Association) brand Orange Squash, ripe fruits with loose skin are taken. The outer jackets of the oranges are peeled manually. 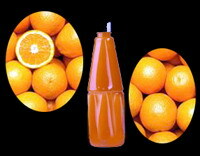 The rag sticking to the segments is removed as it creates some bitterness in the juice if allowed to remain. The segments are passed through the juice extractor for juice. The juice is kept separately. In the jacketed vessels, sugar, citric acid and water are mixed together and heated. The solution is cooled and filtered through cloth. 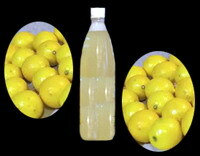 The clear syrup is mixed with the juice and stirred till a uniform solution is obtained. To improve the end product, small quantities of appropriate essence and colours are added finally, stirred to get a perfect homogenous mix. After mixing all ingredients, the preservatives potassium meta-bi-sulphite is to be added. The compound dissolved previously in small quantities of juice is added and mixed thoroughly. The squash is then filled in washed and sterilised bottles leaving about one inch space as head room. The bottles are then closed with airtight lid. They are then stored in a cool dry place. The product keeps well for one year without change in colour or taste. In the same way, we prepare the squashes at home also not only from the above fruits but also from others. But there are slight differences that you may note as you read further. For preparing squash we need 25% filtered/strained fruit juice, 40% sugar and 35% water, i.e. juice: sugar: water::5:8:7. The procedure varies from fruit to fruit for preparing juice. As explained in the previous postings, extract the juice of the fruit according to the nature of the fruit, strain or filter as the case may be and measure its volume. Then add sugar and water in the proportion mentioned above. For instance, if the extracted juice measures 500 gms, then take 800 gms of sugar and 700 gms of water. Keep the juice aside and do not add sugar or water to it. Instead, just add sugar to the water only as calculated, stir well and heat. Allow it to boil while stirring constantly. When it starts boiling, add citric acid and mix well. Remove from fire. Filter this sugar syrup with citric acid and add the filtered fruit juice to this syrup. If preferred, add suitable colour and appropriate essence. Out of this, just take 2 tablespoonfuls and mix thoroughly to it the preservative – potassium meta bisulphite (KMS) – and again drop it to the whole mixture of squash to mix again. Now fill up sterilized bottles or jars leaving head room for expansion before sealing airtight. Remember that the preservative KMS is not added to all squashes but to certain fruits only. For the rest we use SB, sodium benzoate. This may be evident from the table provided below for ready reference. If you have 1500 ml juice of the fruit, you may get 6000 ml of squash. If the fruit juice is sour, then reduce the quantity of citric acid and if bland, increase. This entry was posted on May 9, 2012 at 11:00 am and is filed under Jams, Morabbas, Squashes and Sauces with tags blackberry squash, citric acid crystals, essence, food colours, grapes squash, Jam, Jelly, lemon squash, mango squash, Morabba, musambi squash, orange squash, pectin, pineapple squash, potassium metabisulphite, sauce, sodium benzoate, squash, sugar. You can follow any responses to this entry through the RSS 2.0 feed. Both comments and pings are currently closed.